Simple, colourful, and delicious! 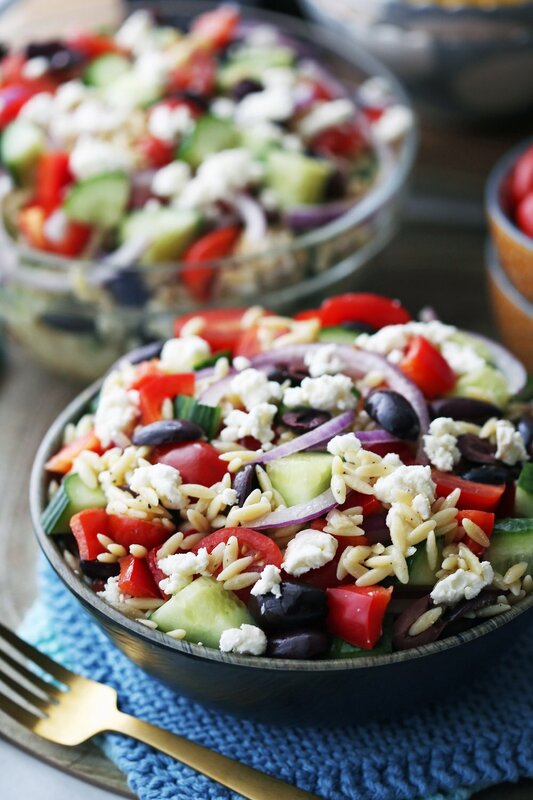 This Greek pasta salad recipe features orzo along with lots of fresh vegetables and a homemade vinaigrette. Easy to make, tastes great for days, and perfect for your next barbecue or potluck. 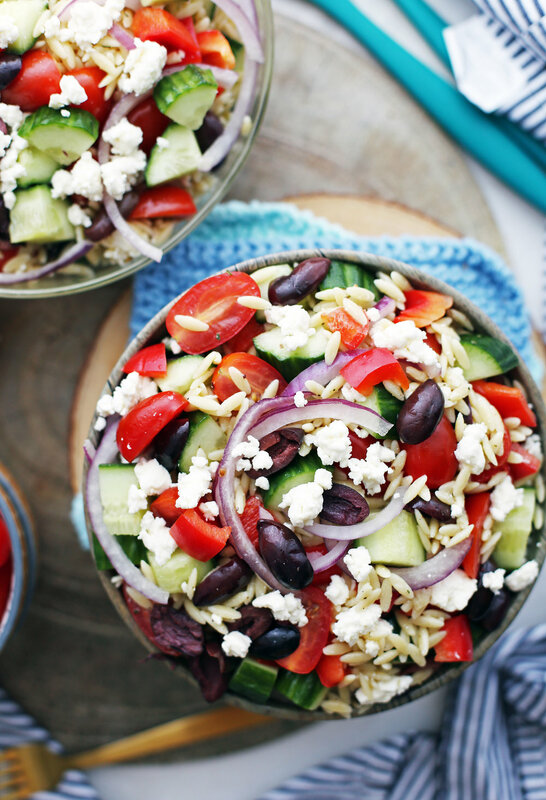 This is a scrumptious, colourful, and filling pasta salad recipe featuring rice-shaped orzo (aka risoni) pasta, a variety of fresh vegetables such as crunchy cucumber and juicy grape tomatoes, fruity and salty Kalamata black olives, zesty feta cheese, and a homemade vinaigrette that ties everything together! It’s perfect to bring to a potluck, a get-together or for meal prepping as it tastes wonderful for days. I hope you enjoy this recipe for Greek Orzo Pasta with Lemon Vinaigrette! How do you make this pasta salad recipe? Cook orzo pasta until al dente, prepare the vegetables, and measure out the cheese. Full ingredient amounts and instructions in the recipe card down below). You can buy pitted olives (it’s less work to prepare! ), but olives with pits tend to be less expensive. Place the olive on a flat surface and then using your thumb or the flat side of a chef’s knife, flatten the olive until the olive cracks, making it easier to squeeze or pull the pit out. Alternately, you can use a paring knife by slicing around the pit to halve the olive, making it easy to remove the pit. Place the orzo and vegetables, olives, and cheese in a large bowl. Place all the vinaigrette ingredients in a mason jar, seal with the lid, and shake until well-combined (or whisk in a medium bowl). Drizzle the dressing on top of the salad and toss to combine. Enjoy! Here are three more tasty pasta salad recipes! Delicious: This recipe uses tasty small pasta, fresh colourful vegetables, rich, fruity and briny black olives, and creamy feta cheese all mixed with a complementary homemade lemon red wine vinaigrette. Simple to prepare: It doesn’t require any fancy technique and is ready in 30 minutes. A wonderful lunch or side dish that tastes great for days. Great for taking to gatherings such as potlucks or barbecues as this recipe makes a generous amount (12 cups!). Adaptable and scalable such that you can make more or less and use the vegetables you have on hand that you think will go well in this pasta salad. Vegetarian too. Make it vegan by omitting the cheese and honey from the dressing if you like. I hope you try this pasta salad! If you make this recipe, please leave me a rating and comment down below or tag me on any of my social media. I’m @yay_for_food on Instagram. Please share your recipe pictures! For the pasta salad. Cook the pasta according to package directions until al dente. Drain and rinse with cold water, until pasta is cooled*. Set aside. 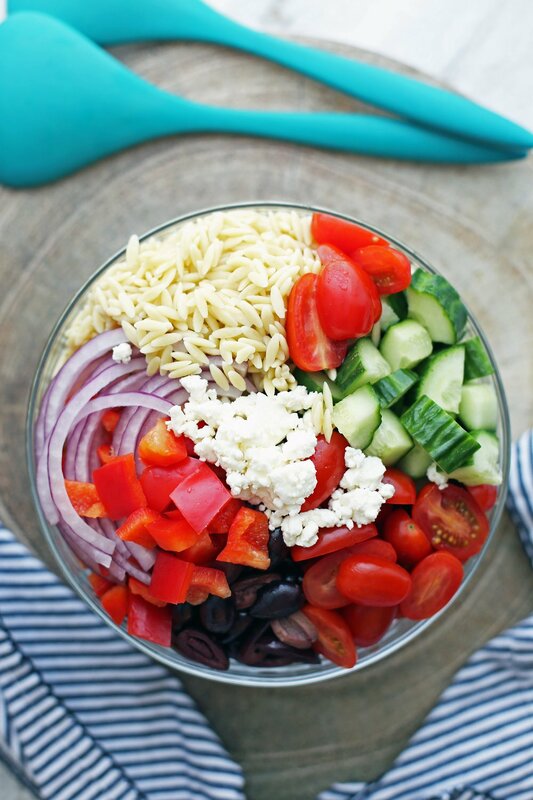 As the orzo cooks, prepare the vegetables and measure out the feta cheese. For the lemon vinaigrette. Place the vinaigrette ingredients in a food safe jar, seal with the lid, and shake the jar until the ingredients are well-combined (or whisk together the ingredients in a medium bowl). Taste and adjust to flavour preferences. Put it together. In a large bowl, toss together the orzo, vegetables, feta, and vinaigrette until the pasta and vegetables are coated with the dressing. Taste for additional salt and pepper. Serve immediately or cover and refrigerate before serving. *After draining the hot water from the pasta, run the pasta under cold water to stop the cooking process and rinse residual starch off. Nutritional information represents one serving for a total of ten servings. *Nutritional values are estimated based on the ingredients used by the author; your ingredients may differ. Sign up with your email address to get the latest recipes from Yay! For Food.